Considering the fact that I have a thirteen year old son, it shouldn't seem too odd that I had never heard of the book, Pinkalicious. 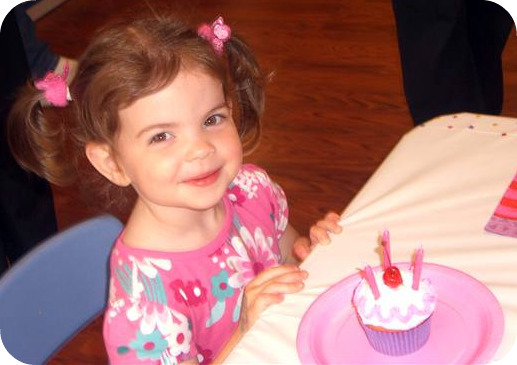 However, that all changed when I volunteered to make cupcakes for my friend's daughter's third birthday party, as I became a bit of a subject matter expert on the story. The book is about a little girl who eats so many pink cupcakes that she turns pink! Erin just loves it and asks her mom to read it to her just about everyday. And who could blame her? This book so so cute and girly, with it's unique illustrations and silly, albeit moralistic plot. 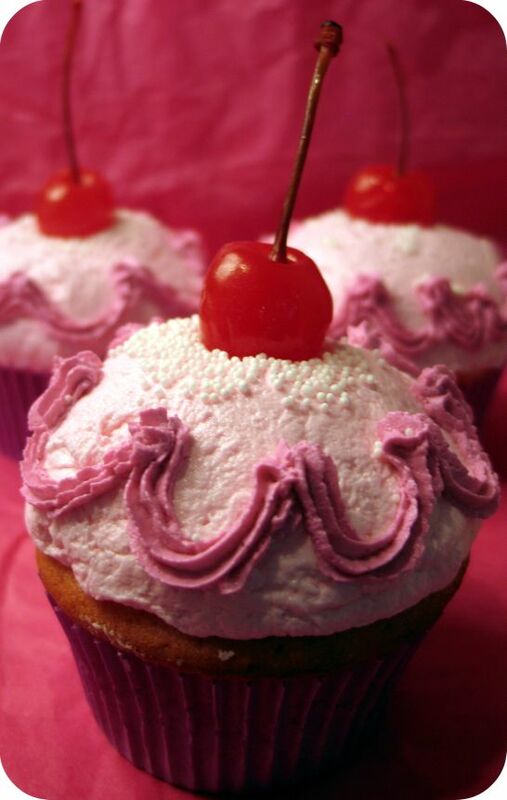 At first glance, the cupcakes seem simple enough, but it was much more than a little pink icing, some sprinkles, and a cherry. The part I found most challenging was the frosting and getting the tall, rounded shape perfected. After a bit of research, I was able to achieve this by adding just a little flour to the frosting, which was the perfect stabilizer. Admittedly, the frosting looked a little on the dry side, but it had to be to support the domed shape, hold on to the fuchsia swag border, and the cherry on top. Perhaps someday I'll come up with a smoother, more visually appealing recipe, but I think in the end it worked out really well. These cupcakes were challenging but so much fun to make! I actually squealed with delight when I was done making them because I felt they looked just like the cupcakes that were in the book. 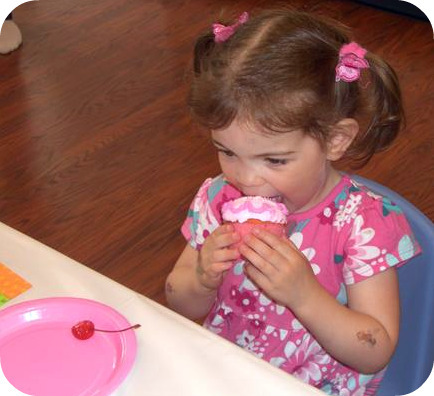 The best part was that Erin did too; she really thought her cupcake was Pinkalious! Yield: This recipe makes exactly 24 cupcakes. Note: The following recipe is one that I put together and is no way endorsed by the publisher or authors. If you'd like to use their recipe, they have one available on their site. 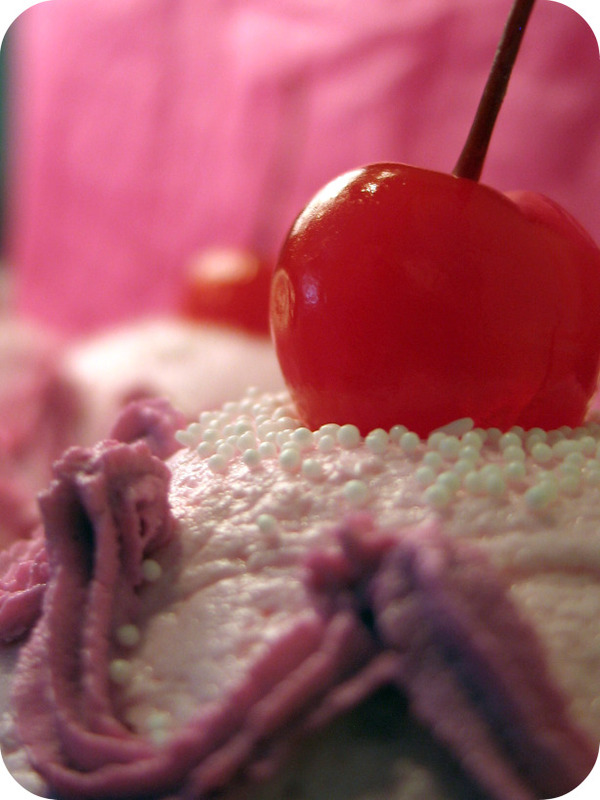 Before you start baking, remove the cherries from the jar and let drain on a few folded paper towels. Discard any cherries that aren’t in good shape (those you get to eat!) After about an hour, flip the cherries over. Cover lightly and set aside. Preheat oven to 350F. Line two cupcake tins with 24 cupcake liners. Set aside. Sift together the flour, baking powder, baking soda, and salt. Set aside. Mix 2 tablespoons of the sour cream with just a pin sized amount of the food coloring gel. Be sure to mix it together really well, breaking up any globs. Keep adding more food coloring until the color is the right shade of pink – you want it a little bit brighter than what you envision the end product to be. Add a little at a time until you get the desired shade. Add this to the larger bowl of sour cream and mix well. If the color is too light, remove a tablespoon of the sour cream and repeat the process again. Set aside. In a large bowl, using an electric mixer, beat butter and sugar until light and fluffy, about 5 minutes. With mixer on low, beat in eggs and yolks, one at a time, mixing one minute for each one. Beat in vanilla. 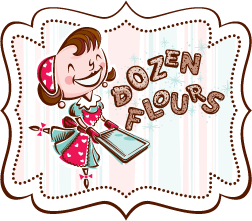 Alternately beat in flour mixture and buttermilk, beginning and ending with flour mixture; mix just until combined. If the color of the batter is not the color you had envisioned, remove a tablespoon of batter to a little bowl, add more color, mix well, and then add it to the big bowl of batter. Mix well. Repeat this as necessary. Fill the cupcakes about 2/3 way full and smooth the tops as best you can. Bake for 15 to 18 minutes until a toothpick put into the center of the cupcake comes out clean (a few crumbs are okay). 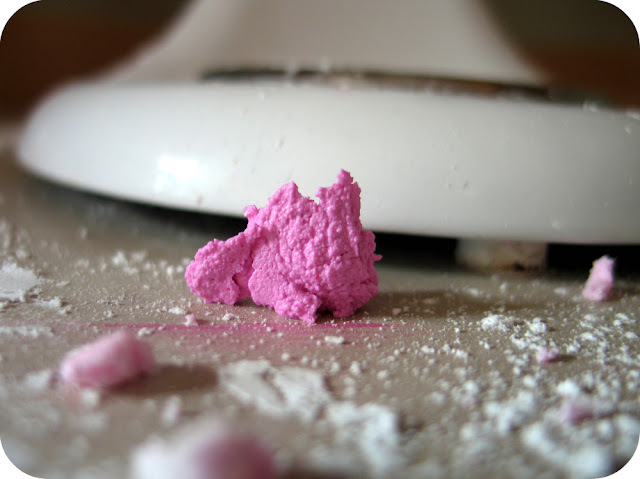 Be careful not to over bake - you don't want brownish pink cupcakes! In a small bowl, mix together the milk and a very small amount of food coloring gel – and I mean a very little bit. You want to achieve only a pale pink. In a separate bowl, sift together the powdered sugar and flour. Set aside. 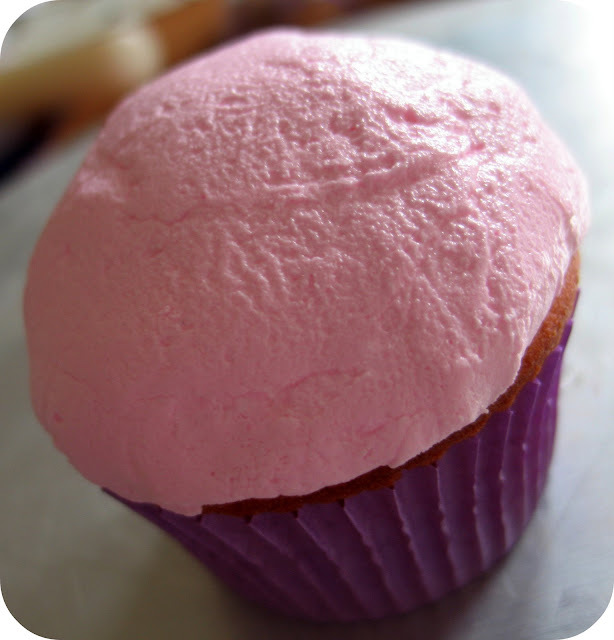 Note: If you find that after you add the pink milk mixture to your frosting that the frosting is too pink, you can use Wilton’s White-White icing color to mute it. It works wonders! Reserve about 1 1/2 to 2 cups of the frosting and cover it to keep from drying out. 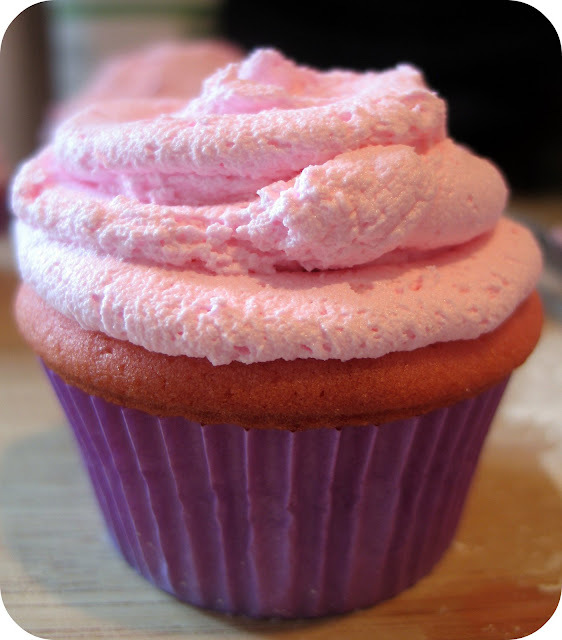 This becomes the "fuchsia frosting". Instructions to follow. In a clean bowl of stand mixture, mix the frosting for about 30 seconds just to warm it up. 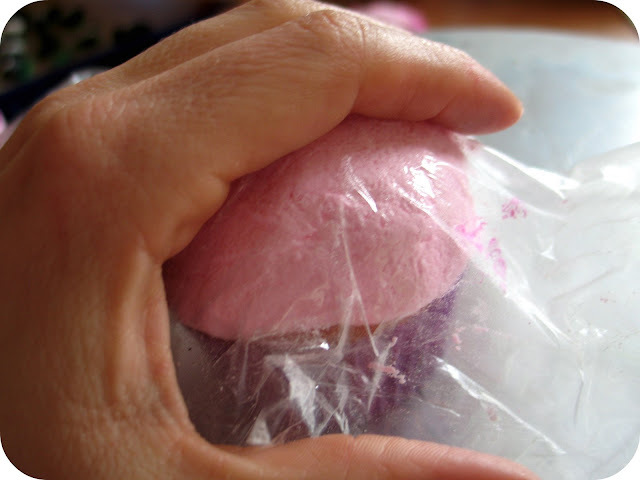 In very small quantities, add a blob of pink/bright red food coloring gel. Mix until it’s well combined. You want the color to be saturated and very bright pink. When you’re there, add just the tiniest bit of purple to the mixture so that it deepens the pink to the point that it’s about to go purple. Unfortunately there’s no good way for me to precisely measure the amount of food coloring I used. You just have to go slow and be patient. Make sure you have a reference point for the color you’re trying to achieve near by to keep you calibrated. Get your piping bag ready with the Ateco 15 tip and add the frosting to the bag. Pour the white non-pariels into a small rounded bowl and have a small spoon at the ready. Set aside. Have a little cup of water ready. Set aside. Pipe a generous amount of frosting on the top of each cupcake, doing your best to create a domed shape. Don’t worry about it looking perfect and pretty at this point just try to go for height. Using a small off-set spatula, gently coax the icing into a somewhat smooth domed cap of frosting. You may need more frosting so add it if you need to. Loosely Cover the top of the cupcake with piece of plastic wrap – one that is large enough to completely cover the cupcake. Cup one of your hands and gently use it to gently push against the plastic wrap, forming the surface of the cupcake into a rounded surface. Continue to press and mold until you get a smooth (or close to it) cupcake surface free of dents. This sounds a bit difficult, but believe me, when you’re in the moment, it will make sense. While the frosting is still damp, turn the cupcake upside down and drip the top of it into the bowl of sprinkles. Use the spoon if you need it to direct the sprinkles around the cupcake and/or to tamp them down. Now, if you find that the non-pariels are not sticking to the surface it just means that the frosting is too dry. Using your finger, gently dampen the surface of the cupcake (just a teeny tiny amount of water works wonders) and try again. Using a bit of pressure, slowly pipe a continuous “w” shape on the sides of each cupcake. It really helps to have a cake stand that turns to do this, but if you don’t, just pipe with one hand while you slowly turn each cupcake with the other. The key here is the placement of the frosting-swag. If your cupcake has a good sized dome, you should have a nice horizontal surface to work with. 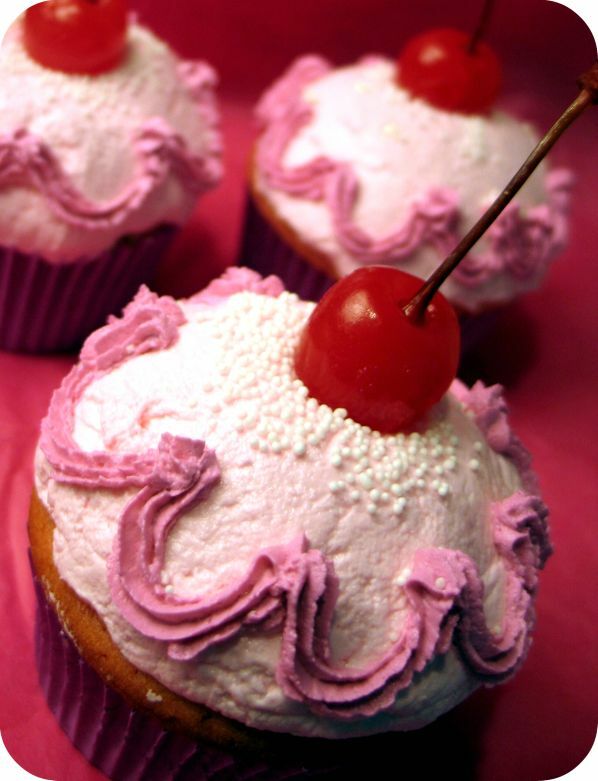 Top each cupcake with a cherry and tap it down just a bit to hold it in place. Keep the cupcakes covered until you’re ready to eat them. those are perfect! soooo much better than the hastily thrown together pinkalicious cake my daughter and i made last fall. That last picture is so adorable! Sadly, as the mom of a boy, I've missed out on Pinkalious, too! I know you made her birthday!!! She must have been so excited! She's a cutie! I have a babygirl but when she turned 8 she decided that she didn't like pink or purple anymore. Great job on the cuppycakes. Btw, sorry I haven't emailed back. I've been busy & trying to catch up. So cute! I love your cupcake creation. Definitely pinkalicious! Thanks for the tutorial on how to mound the icing so perfectly too. My daughter loves the book Pinkalicious! Too Cute! Now you need to make Purplelicious, that's another book from the same author. These are adorable! Thanks for the step by step photos of the process! You are an amazing baker! I mentioned to Andrea that I would love to have you visit our MOPS group in Fairwood sometime and do a cupcake presentation for the moms. They would love it! What a treat that would be! 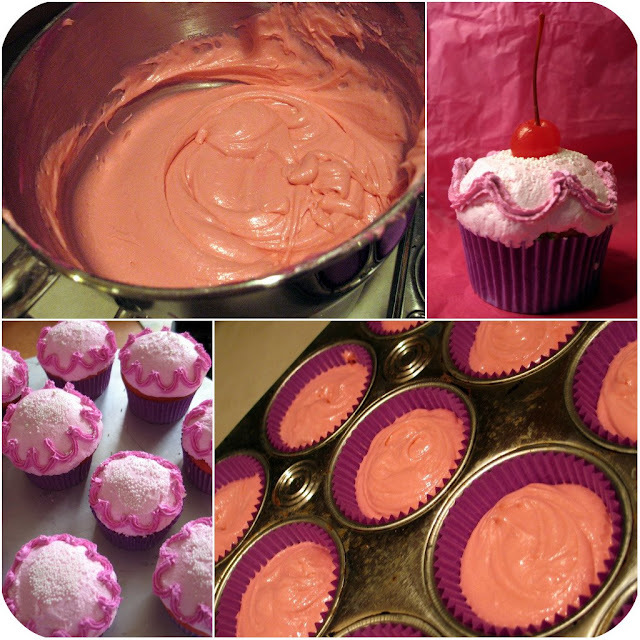 Pink Cupcakes? My two favorites! Thanks for sharing Julia! you just made my daughter's Friday! She LOVES this book, in fact just yesterday she asked if we could buy it since she is sick of just taking it out of the library! thanks for the tip about the plastic wrap--it makes for a much neater frosting job! thanks o much for showing us how to get that icing nice and high!! I did a pinkalicious theme too. Ohhh that is just so darling and so sweet of you. She looks like one happy birthday girl. They really do seem like a lot of work - but worth it! Perfectly lovely! What a lucky girl she is! I just bought this book for my daughter's bday, and I know we will be making these soon, Thanks! !